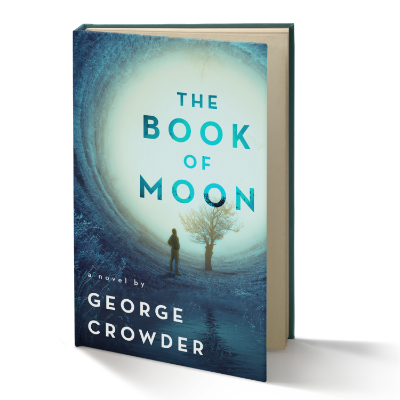 You’ve stumbled onto the web site for George Crowder, author of The Book of Moon. The Book of Moon is a story about 15-year-old Moon Landing, whose world is disintegrating along with his parents' marriage. To make sense of it all, Moon embarks on a quest to learn who his parents are—what brought them together and what drove them apart—and what it all means for his future. It's a good story. At least I think so. Why did I write it? During the economic downturn of 2008, I was working for the Los Angeles United School District as a math coach. Math coaches were on the chopping block, and I was in danger of being bumped back to the classroom. I'd still have a job, but it would have been a sea change for my daily life. I needed an exit strategy, so I wrote a novel. Okay, I didn't say it was a smart strategy. I wrote the story I wanted to write, which, as it turns out, happened to fall into one of the lesser known genres of literature. As one Amazon reviewer put it, it's a "YA novel for adults." As if there were such a thing. If I had it to do over again, though, I'd still write the same novel. I like the story. I like the characters. And with an average 4.7 star rating from over 400 reviews on amazon.com, it turns out a lot of other people like it too. On this site, you’ll find information about me, the novel, what's up next, how to get in touch, and perhaps a freebie. Feel free to drop me a line. And if you enjoyed my book, I’d love to hear about it. I was immediately hooked. This is smart, snappy, and truthful storytelling, simultaneously humorous and thought provoking. I will read more from Mr. Crowder. – Gary C.